Will New York Add Another Anti-Smoking Law To The Books? On March 21st, a bill making it illegal to smoke while walking in New York City was introduced into the New York legislature. While smoking is already banned in a number of public spaces in New York City, the proposed legislation would impose a $50 fine on anyone caught smoking and walking on city streets. The bill is being pushed as necessary to protect pedestrians from secondhand smoke, although it would still allow smokers to smoke on public streets; it would simply mandate that smokers remain stationary while doing so. Between 2003 and 2017, a number of anti-smoking measures were signed into law here in New York. The New York State Clean Indoor Air Act prohibits smoking in virtually all workplaces, including bars and restaurants. It also enables localities to adopt and endorse laws regulating smoking which are stricter than the Clean Indoor Air Act. 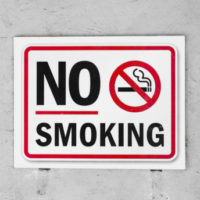 Specifically, smoking is prohibited in bars, bingo facilities, commercial establishments, enclosed indoor swimming areas, general hospitals, indoor arenas, places of employment (including where services are offered to children), public transportation, public and private colleges, residential healthcare facilities, restaurants, schools and school grounds, and zoos. The law also prohibits employers from providing smoking breaks rooms for employees, and mandates that “no smoking” signs be prominently posted. A city or county health department can assess a penalty of up to $1,000 against any violator for each violation and where the State Health Department provides enforcement, that penalty increases up to $2,000 per violation. This leaves smoking permitted in cigar bars (established prior to January 1, 2003), hotel or motel rooms, membership associations, private homes and residence (as long as they are not used for day care), private automobiles, retail tobacco businesses, and seating in outdoor areas of restaurants (as long as they do not have a ceiling or roof). In addition, smoking is allowed in a number of locations such as restaurants, bars, etc. if these areas are being used for the sole purpose of inviting the public to sample tobacco products, where serving food and drinks is incidental to this primary purpose. Under New York State Penal Law, anyone found selling tobacco or causing tobacco to be sold to a child who is less than 18 years old will be found guilty of unlawfully dealing with a child in the second degree, which is a class B misdemeanor, and carries a prison sentence of up to three months. If you have been accused of violating one of New York’s anti-smoking laws, speak with experienced criminal defense attorney Phillip J. Murphy today to find out how we can help.